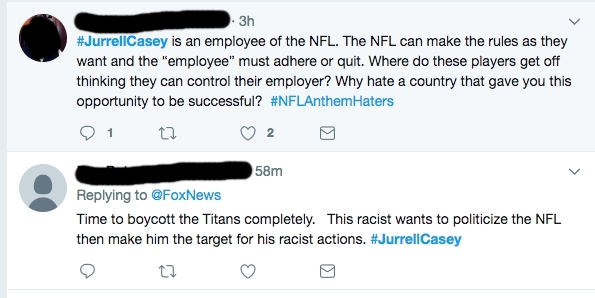 During an interview in London, at an NFL sponsored event, Tennessee Titans’ defensive lineman, Jurrell Casey, made some controversial statements regarding the new NFL anthem protest policy. “I’m going to take a fine this year, why not? I’m going to protest during the flag. That’s what I’m going to say now.” He further commented that he will continue to protest just as he has for the last few seasons – by standing for the anthem and then raising his fist as the anthem ends. He chose this protest because he did not want to disrespect the flag, anthem, or military. Evidently, that is not enough for a certain segment of the Tennessee Titans’ fan-base. Social media blew up last night in Titans’ land. Some fans want him cut from the team. Some fans are announcing that if he goes through with this they will no longer support the team. Conservative talk radio in Nashville has been just as over-the-top in its response. Popular radio Host Phil Valentine tweeted out that if Casey, or “bozo” as he decided to label him, carries out this protest, then he is done with the team. On Nashville Morning News with Brian Wilson, caller after caller lambasted Casey for his disrespect to the flag, anthem, and everything we hold dear. The problem with all of this should be obvious to anyone paying any attention at all. Granted, paying attention is difficult for some. Nearly every person that I heard call in the radio show this morning was angry that Casey was going to kneel for the anthem. He is not. He stands for the anthem. He stands because he “wanted to be respectful.” He stands and when the anthem ends, he raises one fist in the air. He will continue doing just that. Clearly, that part of his statement and his track record has escaped many Titans’ fans (and radio personalities). Even worse, many of the callers took cheap shots at the way Casey spoke, with not-so-subtle shades of bigotry and even racism. Look, I am loathe to accuse anyone of being a racist. I think that accusation is hurled about way too often in our society. Sadly, what I heard today reinforced in my mind that it plays a role in this debate. Casey did not choose his words perfectly. It was clearly off-the-cuff and not a prepared statement, and when one speaks that way, there is a tendency to say things less clearly than intended. I won’t say he misspoke, but his message was not delivered as concisely and effectively as it could have been. I am willing to give him a pass on this due to everything he has done in his career and the man he has shown himself to be. Casey’s actions in the past, his off-the field actions, and his overall track-record of integrity should inform everyone of what his intentions truly are. There were also the cries from fans about how Casey is making nearly $15 million a season to play a game and he should be grateful for that and just shut up, stand up, and play football. It’s amazing to me that those who are ostensibly the most pro-capitalism people in the world would begrudge athletes for making millions in what is one of the most capitalist ventures in the world. Mocking NFL players because they make a lot of money is about the most self-defeating argument available to the conservative capitalist. Playing a sport for a living does not mean you lose your rights to speak your mind. I have gone on record on my feelings about the anthem protests. You can read those here. To sum up my views: while I agree that players have the right to protest, choosing to do so during the anthem is not productive. It paints them as villains and unpatriotic to too many people. Coupled with the fact that Colin Kaepernick, the player who started all this anthem protest discussion, made incredibly negative comments about the flag after his early protests and from that point on, many fans were going to view any anthem protests in the same light. This remains an incredibly complex and difficult topic. Unfortunately, the loudest voices seem to be doing their best to reduce it to the level where you are forced to pick one of two sides – and both sides are flawed and their arguments are problematic. Frankly, that is irrelevant to this Casey/Tennessee Titans situation. Casey is not disrespecting the flag or anthem. He stands and shows respect during the anthem. His protest is the best possible version of any of these protests because he is still able to express his opinion but he is doing it in a way that cannot be perceived as a slight to the country, the military, the flag, or the anthem. Well, it can be perceived that way, but only by people that are either ignorant or willfully deceptive. Neither of those options are good. Titans’ fans, be smart. Look at Casey’s career. He has been a model citizen, on and off the field. He has been involved in the community. He has done nothing to deserve mockery or attacks. These types of responses make the fan-base look stupid. They drive a further wedge between players that feel that there are injustices in the country that need to be addressed and the fans that cheer on the team who feel the matter is overblown. As fans, we need to be better than this.